Barcelona's dream of going a whole La Liga season unbeaten ended in their penultimate game as they were beaten by lowly Levante in a remarkable match. The hosts moved into a 5-1 lead, with Emmanuel Boateng scoring a hat-trick and Enis Bardhi netting twice. Barca's Philippe Coutinho scored a hat-trick of his own and Luis Suarez netted a penalty to set up a tense finale. But the champions could not find an equaliser as they fell to a first La Liga defeat in 44 games. Ernesto Valverde, beaten in the league for the first time as Barcelona boss, may regret his decision to rest top scorer Lionel Messi for the trip to 15th-placed Levante. After coming through their game against Real Madrid unbeaten last weekend, it looked as though history beckoned for Barcelona. No side have gone an entire Spanish top flight season unbeaten since the 1930s, when there were only 18 games in a season. But they fell just short in a match that almost defied logic - they had only conceded 24 goals in their opening 36 games. With the league and cup double already wrapped up, and their Champions League run long over, it makes next Sunday's final game against Real Sociedad largely irrelevant - except to send off departing captain Andres Iniesta. 59 mins: 5-2 - Coutinho slams home from close range after Suarez's shot is blocked, but surely they cannot come back? 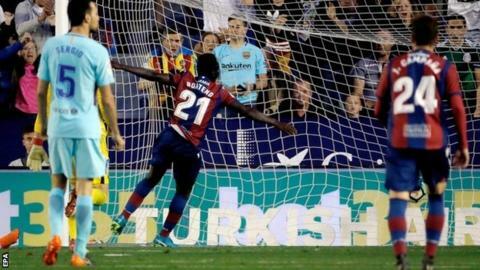 Barcelona should have expected a difficult evening at Levante, who have had a dramatic revival under boss Paco Lopez. When he was promoted from his role as reserve-team boss in March, the club were only one point above the relegation zone. But they have now won eight of their 10 games since his appointment - to take them 17 points clear of the bottom three. Lopez said it would be "historic" for Levante, in their first season back in the top flight following promotion, to beat Barcelona and there were big celebrations at the final whistle on a famous night for the club nicknamed the Frogs. Match ends, Levante 5, Barcelona 4. Second Half ends, Levante 5, Barcelona 4. Yerry Mina (Barcelona) is shown the yellow card for a bad foul. Foul by Yerry Mina (Barcelona). Giampaolo Pazzini (Levante) wins a free kick in the attacking half. Giampaolo Pazzini (Levante) is shown the yellow card. Attempt missed. Rubén Rochina (Levante) left footed shot from the centre of the box is close, but misses to the right. Denis Suárez (Barcelona) is shown the yellow card. Jefferson Lerma (Levante) is shown the yellow card. Offside, Levante. Rubén Rochina tries a through ball, but Enis Bardhi is caught offside. Substitution, Levante. Rubén Rochina replaces José Luis Morales. Attempt missed. Coutinho (Barcelona) right footed shot from outside the box is too high. Attempt blocked. Sergio Busquets (Barcelona) right footed shot from the right side of the six yard box is blocked. Assisted by Denis Suárez with a cross. Corner, Barcelona. Conceded by Antonio Luna. Attempt saved. José Luis Morales (Levante) right footed shot from the centre of the box is saved in the bottom left corner. Assisted by Jefferson Lerma. Corner, Levante. Conceded by Yerry Mina. Substitution, Levante. Giampaolo Pazzini replaces Emmanuel Boateng because of an injury. Offside, Barcelona. Denis Suárez tries a through ball, but Luis Suárez is caught offside. Attempt blocked. Denis Suárez (Barcelona) right footed shot from the centre of the box is blocked. Assisted by Paco Alcácer. Attempt missed. Luis Suárez (Barcelona) header from the centre of the box is just a bit too high. Assisted by Denis Suárez following a set piece situation. Foul by Jefferson Lerma (Levante). Goal! Levante 5, Barcelona 4. Luis Suárez (Barcelona) converts the penalty with a right footed shot to the high centre of the goal. José Campaña (Levante) is shown the yellow card. Penalty Barcelona. Sergio Busquets draws a foul in the penalty area. Penalty conceded by Emmanuel Boateng (Levante) after a foul in the penalty area. Substitution, Levante. Jefferson Lerma replaces Roger Martí.